Berwick boss John Coughlin was left to rue his side’s disciplinary problems as Cowdenbeath snatched a last-gasp equaliser at windswept Shielfield Park. By that time, his team were down to nine men after straight red cards for Steven Thomson and Steven Notman. However, there was controversy over the added time leveller from sub Cameron Muirhead as Rangers felt they should have had a free-kick moments earlier. Coughlin said: “We thought we had done enough to get over the line. We were having to defend manfully after the sending off. “I’m 100 per cent convinced it was a shove in the back of Darren Lavery and it’s a very different outcome if the referee gives a foul there, but for some reason he elects to play on – the resultant red card I can’t condone because I think Stevie has dived in very rashly on the back of not getting the free-kick. Greg Rutherford opened the scoring for the home side with the first real chance of the game after 17 minutes. It came when Lavery found space 25 yards out and he played in Michael McKenna in the inside right channel. It looked like his cross would be blocked but it found its way to Rutherford just six yards out and he tucked away the simple chance. Berwick continued to have the better of the play without looking particularly threatening, but it was Cowdenbeath who came close to levelling on 32 minutes when referee Kevin Graham played a good advantage after a foul by Jonny Fairbairn and the ball was played through to Burton O’Brien, whose effort was smothered well by the on-rushing Kevin Walker. 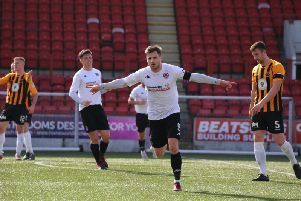 However, Berwick should have gone two up five minutes later when Jordyn Sheeryn found himself in acres of space 12 yards out, but he shot too close to keeper David McGurn, who beat it away quite comfortably. A minute later they went close again when Nickolay Todorov headed narrowly over his own bar after good work by a twisting and turning Steven Thomson down the right. It was Cowdenbeath who then started to take advantage of the wind in their favour in the second half with a prolonged period of pressure. They felt hard done by when Renton slotted home but the referee had already blown the whistle for a head injury to Kevin McKinlay. Kyle Miller nearly equalised with a 30 yard free-kick which was tipped over by Walker. Moments later, from the corner, Berwick were reduced to 10 men when Thomson was shown a straight red for deliberately handling Kris Renton’s goalbound header. However, Dean Brett’s spot-kick was pushed against the underside of the bar by Walker and the referee’s assistant ruled it had not crossed the goal-line. The visitors went close again on 73 minutes when Miller’s 25 yard free-kick was well saved by Walker and scrambled to safety. David Robertson scooped narrowly over with two minutes remaining as the visitors continued to press. Notman then saw red as the game went into added time, but there was still time for Muirhead’s effort to creep into the corner of the net to earn the Blue Brazil a point and leave Berwick frustrated.